This Is Your Captain Speaking: Will There Be an Airline Strike? The pilots of Southwest Airlines are the latest airline labor group to reject a proposed labor contract. By a vote of 62% against, the 8000 pilots at Southwest recently voted to turn down a tentative agreement which was forged after three years of negotiations with the low cost carrier. Earlier this year the pilots at Delta Airlines and flight attendants at Southwest also rejected proposed contracts. Does this mean that there will be an airline strike soon? While the future is impossible to predict, the answer is probably not. To understand why, it is important to understand how the negotiation process works at airlines. It is somewhat different than at other unionized industries. Collective bargaining at most unionized industries in the US is governed by the National Labor Relations Act of 1935, also known as the Wagner Act. This law provides for the formation of labor unions and the right to bargain collectively for wages and work rules. The law also sets down the requirements for the conduct of strikes and/or lockouts. 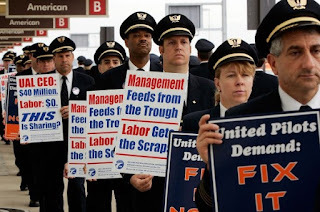 Airlines, however, are not included under the provisions of the Wagner Act but rather are governed under a law known as the Railway Labor Act or RLA. Passed in 1926 as a result of negotiations between the railroads and their unions, the RLA was an effort to balance the rights of workers with the realization that a strike against a railroad could be acutely disruptive to the national economy as a whole. Airlines were included under the jurisdiction of the RLA in 1936. Under the RLA, contracts never "expire", but rather they become "amendable". Should an agreement not be reached by the amendable date of a contract, both workers and management are obligated to continue on as before while a new agreement is crafted. Should an agreement not be reached, the RLA provides for specific requirements to be met before either management or labor is "released" to "pursue self help" otherwise known as a strike or lockout. One of these requirements is for an impasse to be declared by a mediator after which a mandatory 30 day cooling off period is observed. Only then would a strike be authorized. No airline today is anywhere near this happening. And even when it does happen, it might not happen. The RLA contains a provision wherein if a labor action threatens to "substantially to interrupt interstate commerce to a degree such as to deprive any section of the country of essential transportation service," the National Mediation Board (NMB) may notify the President of an imminent threat to commerce. The President may then appoint a three member board to make recommendations for a resolution. This delays a strike even further. This last happened in 2001 when President George Bush intervened in a labor dispute between Northwest Airlines and its mechanics by invoking a PEB. Before that, Bill Clinton used a PEB to head off a strike by pilots at American Airlines in 1997. With only four major airlines controlling a majority of air travel, it is possible that airline strikes may be a thing of the past. No president wishes to be seen doing nothing in the face of packed terminals and irate flyers. But as I mentioned above, no current airline is anywhere near an impasse in negotiations. In fact, due to the ongoing pilot shortage, airline managements may wish to get labor troubles behind them quickly as the competition heats up for a dwindling number of pilots needing to be hired to replace the tsunami of retiring pilots. This happened recently at Republic Airlines where management threatened to declare bankruptcy in order to increase pilot wages to attract applicants. Republic had been cancelling flights due to a lack of pilots. Excellent summary. When Congress amended the RLA by adding Section 159a in 1981, they effectively ended labor actions of any kind, leaving only management to decide wages, benefits, and work rules. The result, predictably, is that the career has become something few young Americans want to pursue.